This entry was posted in Racing on January 11, 2013 by Steve Tilford. Short update. I spent all day bouncing around between medical buildings. In the meantime, Catherine rode her bike to the urgent care clinic the morningand next thing I know, Trudi was taking her to the hospital where she had to have surgery because of her crash. I guess her lung collapsed and didn’t refill, allowing air/fluid behind it. So, she is in the hospital until Monday with a tube in her chest. I have a huge tear in my rotator cuff cartilage that won’t repair on its own, so I need surgery too. More later. Okay, I have more stuff to do, but didn’t see any bike racing today, which is a drag. 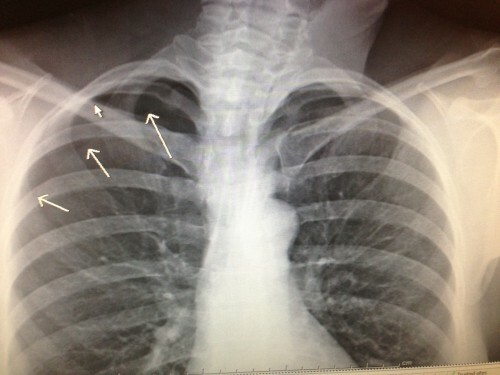 My x-ray. But, I needed a MRI to show the damage. Is it a full thickness tear of the supraspinitas tendon? Ouch!! But it actually makes more sense than a seperated shoulder. I was trying to figure out how anyone could finish a cross race with a seperated shoulder. Still, I don’t know how you finished with the tear without getting xylocaine injections in the pits. Pure toughness. Congrats on yet another jersey. Any chance with the surgery to compete at Worlds’? Oh so sorry to hear of both Catherine and your injuries. I came home with some purple bruising and strains from my crashes, but I’m gonna be thinking about how they ain’t nuthun’ compared! I wish you both rapid recoveries. Damn – best wishes to both of you for speedy recoveries. I’m so sorry for the bad luck both of you had. No fun. 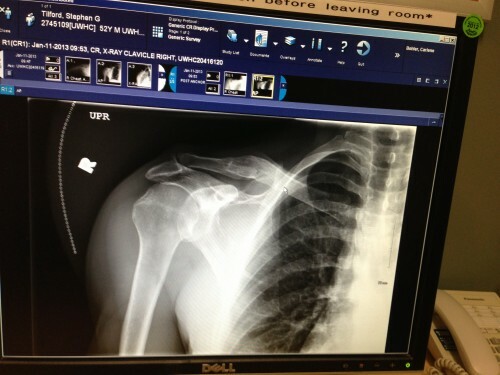 You have one gnarly looking collar bone in your x-ray. How many times have you broken that or was it once really bad?